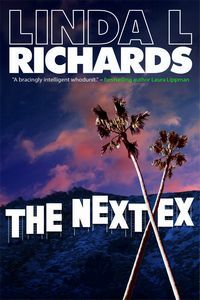 The Next Ex by Linda L. Richards: Synopsis and Online Purchase Options. Synopsis (from the publisher): Even by Hollywood standards, five is a big number if you're counting ex-wives. Teaching an indulged rich wife to dabble in the stock market is the last thing former stockbroker Madeline Carter wants to do. But she's lived among the Hollywood elite just long enough to recognize the ubiquitous "favor for a favor" when she sees it, so she reluctantly agrees to tutor the current wife of "A" list film producer Maxi Livingston. Up until a couple of days ago the only thing Madeline knew about Maxi was what she'd read in the tabloids. But she soon learns a whole lot more, including the fact that the current Mrs. Livingston has plans to build a nest egg for herself — in the stock market. Interesting. But "interesting" doesn't begin to cover it when Maxi's ex-wives are killed off one by one and Madeline finds herself in the middle of a scenario worthy of the most imaginative screenwriter — where she is the prime suspect.